Immerse yourself in the natural beauty of Los Cabos from one of our various luxury hotel suites, complete with stunning ocean views and resort-style amenities. The Cape’s location, along one of the most desirable and secluded playas in all of Los Cabos, promises your guests an unparalleled destination resort experience for celebrations and meetings. Thompson’s elegantly appointed urban contemporary style infused with traditional Mexican craft forge a luxuriously laid-back Southern California vibe throughout the property. Meeting Space: 4,298 sq. ft. | Largest Space: 2,155 sq. ft.
Zadún, a Ritz-Carlton Reserve, set amidst the dunes along the dramatic coastline of Puerto Los Cabos, Mexico. With panoramic views of the Sea of Cortez, this much-anticipated new resort marks the fourth extraordinary property in the prestigious Ritz-Carlton Reserve portfolio.The striking design of Zadún will celebrate the desert and the sea with 115 elegantly appointed suites and villas placed gently along the natural slopes of the land to create the ultimate desert luxury. As a true oasis of relaxation and wellness, Zadún a Ritz-Carlton Reserve will offer one of the destination’s most exclusive Spas. Solaz is a unique Resort that is situated in a privileged location, standing at the junction of Baja California Sur golden semidesert landscape and the turquoise waters of the Sea of Cortez, the unique surroundings, as well as the available amenities ensure our guests comfort and enjoyment. he resort is made up of three levels of staggered terraces with breath taking views of the ocean. These are divided by two gullies, which are an oasis of abundant vegetation in the midst of the semidesert landscape. The resort is surrounded by a high slope intended to protect the interior and keep the noise of the highway at bay. Meeting Space: 9,000 sq. ft.
arth. Sky. Fire. Water. The elements combine in the most alluring way at Viceroy Los Cabos. Go ahead – get connected to them. This is luxury like you’ve never thought possible. 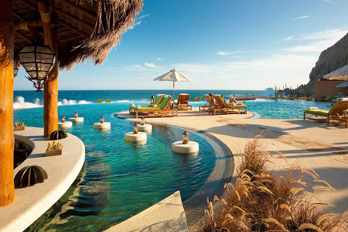 Surrounded by wraparound water, Viceroy Los Cabos is the ultimate dreamscape. Explore it all as nature intended — via elevated walkways, with the cool blue beneath you and the blazing sun overhead. Wherever you turn, a new discovery waits, be it the state-of-the-art fitness center, the full-service spa, or the myriad of restaurants that showcase local ingredients. Enjoy the journey. And take in the vibe, which is equal parts serene (don’t miss the ocean-view terraces) and social (gather at the beach bar and pool). Immerse yourself in Viceroy Los Cabos, an architecturally stunning hotel concept by Miguel Angel Aragonés. Location: 20 min from Airport, 30 min from San Lucas. East of Cabo San Lucas, facing the turquoise waters of the Gulf of California, Grand Velas Los Cabos brings wonder and discovery to one of Mexico’s most vibrant locales. A destination teeming with beauty, from the serene sands of Chileno Beach to vistas that stretch endlessly toward the horizon, Los Cabos is a celebration of Mexcio’s rich culture. Get a taste for the local flavor and dine on artfully crafted, gourmet cuisine from top chefs, embark on a scuba or snorkeling expedition, set out on a wild canyon adventure, or explore the always lively nightlife, bars, clubs and eateries of Cabo San Lucas. Location: 25 min from Airport, 20 min from San Jose del Cabo and 20 min from San Lucas. Situated on a private crescent cove beach Paradisus Los Cabos is a luxury all inclusive resort surrounded by lush gardens and exquisite touches. Beachfront luxury resort located 15 miles from the airport over a unique swimmable beach.Seven restaurants offering world class à la carte cuisine including an international buffet restaurant for all day dining and 7 bars. Lush gardens, terraces and open areas for weddings and events. A unique experience for every guest, from exclusivity for adults in Royal Service to wellbeing for families in the Family Concierge area. Meeting Space: 13,500 sq.ft. | Convention Center with 10 breakout rooms. Location: 30 min from Airport, 15 min from San Jose del Cabo and 20 min from San Lucas. Designed by architect Jim Olson, the new JW Marriott Los Cabos reﬂects the deep blue Sea of Cortez from every angle, while the horizontal structures frame the beauty and colorful textures of the Baja California desert. Jasha Spa- the largest and best equipped in Los Cabos- with a relaxation lounge and a prehispanic-healing atmosphere. The gastronomic experience at the new JW Marriott Los Cabos Beach Resort & Spa seeks to fuse local flavors and international cuisine techniques. Meeting Space: 37,651 sq.ft. | Largest Space: 7,950 sq.ft. Location: 20 min from Airport, 15 min from San Jose del Cabo and 40 min from Cabo San Lucas. Breathless Resorts & Spas are the ideal adult-only escapes in spectacular beachfront settings for sophisticated and social singles, couples and friends. Our resorts are deluxe, modernist and chic, and with Unlimited-Luxury the best of everything is included from delectable gourmet cuisine at specialty themed restaurants and curated cocktails at trendsetting lounges to excellent pool and beach wait service, 24-hour room service, & more! Live Big with endless entertainment like DJ hosted pool parties and vibrant nightly club scenes. Breathe Deep with a treatment at the world-class spa or a euphoric yoga class on the pier. Experience the perfect balance of excitement and relaxation only at Breathless Resorts & Spas! Meeting Space: 3,500 sq. ft.
Montage Los Cabos’ location, including 39 acres on the pristine and gentle waters of Santa Maria Bay, has spectacular views and unique in the Los Cabos region, features remarkable walk-in access to the finest swimming, snorkeling and diving in the region. The resort includes three pools and Montage’s signature, immersive children’s program, Paintbox. In addition, Montage Los Cabos features two dining venues where travelers can enjoy the region’s abundant seafood and innovative use of fresh, local ingredients. This hotel is located on one of the few beaches able to swim in Cabo. Stay at the Westin Los Cabos Resort Villas & Spa and enjoy a luxurious Baja California vacation. In a magical setting overlooking the Sea of Cortez, The Westin Los Cabos Resort Villas and Spa is an empowering escape from the ordinary. Seemingly intuitive service indulges the senses, while an abundance of amenities and activities energize and refresh. Scenic adventures await golfers, beach-lovers, and explorers. Whether your passion is golf, nature, or just the indulgence of a luxurious spa—the resort empowers you to immerse yourself in endless possibilities. Location: 15 min from Airport, 15 min to Cabo San Lucas and 15 min to San Jose del Cabo. Is the only all suite ocean front resort adjacent to 2 championship golf courses and overlooking the Sea of Cortez, this premiere resort offers casual elegance and adds the crowning touch to Cabos most deluxe hotels. It features a large, majestic freeform swimming pool, health club and spa. Meeting Space: 8,000 sq.ft. | Largest Space: 5,156 sq. ft. Location: Hotel corridor, 20 min from Airport, 15 min to Cabo San Lucas and 15 min to San Jose del Cabo. Hyatt Ziva Los Cabos is a unique, all-inclusive experience that offers fine dining options at six à la carte restaurants and two gourmet buffet restaurants, unique spa treatment and nightly entertainment shows. This luxury resort also features meeting facilities and an ideal location. Meeting Space: 46,000 sq. ft. | Largest Space: 11,625 sq. ft. Location: 15 min from Airport, 5 min to San Jose del Cabo and 30 min to Cabo San Lucas. With its cobblestone lanes, winding paths, quaint Placitas, fountains, restaurants, and shops, the Sheraton Hacienda del Mar Resort & Spa, Los Cabos captures the feel of Old Mexico. A full complement of guest services is offered on premises to satisfy the refined needs of both the meeting and leisure travelers. Meeting Space: 12,419 sq. ft. | Largest Space: 12,419 sq. ft. Location: Cabo del Sol Complex. 25 min from Airport, 10 min to Cabo San Lucas. Discover an idyllic paradise on the southern tip of the Baja California peninsula, between colonial San Jose del Cabo and vibrant Cabo San Lucas, along the crystal blue water of the Sea of Cortez. Resort amenities range from shimmering infinity pools with swim-up bars and one of the only swimmable beaches in Los Cabos to five delectable dining venues, whirlpools, tennis courts, Spa Oasis, boutique and more. Meeting Space: 8,000 sq. ft. | Largest Space: 7,445 sq. ft.
At Fiesta Americana Grand Los Cabos All Inclusive Golf and Spa, your stay will be filled with exclusive details, luxury and distinction. It’s an exceptional hotel where everything has been planned for you to live your vacation dreams with Grand Style. You’ll be amazed by the subtle details and diversity of flavors, aromas and colors that emerge throughout your stay. Every day is memorable and different. Meeting Space: 15,000 sq. ft. | Largest Space: 10,648 sq. ft.
A proud member of The Leading Hotels of the World and a AAA Four Diamond property, is situated on a land where tranquil desert meets the untamed waters of the Pacific Ocean. As an all-suite, all ocean view resort, the adults-only Marquis Los Cabos boasts the exceptional amenities of Unlimited Luxury with unlimited food and top-shelf spirits. Meeting Space: 12000 sq. ft. | Largest Space:6350 sq. ft. The Me Cabo Hotel is breathtaking. Poised above Lands’ End arch and Lovers Beach, this five-star resort is a lovers paradise. Here you will discover an uncommon blend of luxurious accommodations, unparalleled guest services and outstanding cuisine. Designed to raise eyebrows, blur boundaries, tempt, tease and seduce. An experience beyond mere accommodation, Inspiring Global Cuisine is served to a groove on the finest stretch of beach in Cabo. Meeting Space: 1400 sq. ft. | Largest Space:1291 sq. ft. Location: Cabo San Lucas, 30 min from Airport. Private patios or balconies with ocean views, Feather-top beds, Extensive pillow menu, 24-hour in-room dining, Nightly turn down service, In-room safe, Non-smoking and wheelchair-access rooms, High speed cable connection in room, Mini refrigerator. Standard guestrooms offer a balcony and full ocean view. One king or two queen beds are available. Meeting Space: 2554 sq. ft. | Largest Space: 2554 sq. ft. Location: Cabo San Lucas, 35 min from Airport. Secrets Puerto Los Cabos provides the ultimate adults only, Unlimited – Luxury escape. Which is more than just a phrase. It is a commitment to fulfilling your every wish and exceeding your expectations at every turn. It includes every amenity you´d expect from a world – class destinations and so much more. Meeting Space: 16000 sq. ft. | Largest Space: 8525 sq. ft. Location: 10 min to San Jose del Cabo, 20 min from Airport. Long and exclusive hideaway for stars of screen, lauded authors and the global jet-set, this lavish Mexico resort is a haven of refined tranquility, with a playful twist of energy and discovery. Here, colorful gardens kiss the air with fragrant tropical blooms, creating quiet paths to the sea. With exquisite perfection reflecting the gracious style of Mexico. Meeting Space: 3000 sq. ft. | Largest Space: 2875 sq. 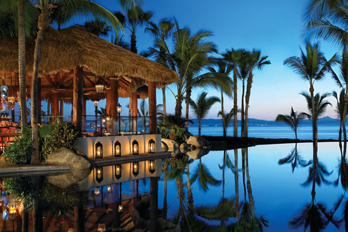 ft.
Is a premier luxury resort in Cabo San Lucas, sits on the southernmost tip of Mexico’s Baja California Peninsula. Encompassing 24 spectacular mountainside and oceanfront acres, our luxury Cabo Hotel rests at the very point where the Pacific Ocean meets the Sea of Cortez, near the legendary rock formations known as Lands’ End. Meeting Space: 1725 sq. ft. | Largest Space: 1725 sq. ft.
Chileno Bay Resort, s brings a new, modern luxury experience to Los Cabos. Our hotel in Los Cabos is set on a protected cove with pristine reefs and tranquil waters. The resort stands apart for its clean, contemporary design, exceptional service and premier location on Los Cabos best beach, one of Cabo’s only swimmable beaches. Meeting Space: 13,895 sq. ft. | Largest Space: 7800 sq. ft. Location: 40 min from Airport, 20 min to Cabo San Lucas and 25 min to San Jose del Cabo. At the end of the continent lies tranquil the Esperanza Cabo resort retreat, where the body is healed, the soul is revived, the senses are awakened and the spirit soars to new heights. The Spa at Esperanza Hotel, with its signature water passage, makes this Cabo Spa world renowned as a relaxing and rejuvenating haven. It has been names the 1st spa in Latin America by Travel & Leisure Magazine. Meeting Space: 6000 sq. ft. | Largest Space: 2000 sq. ft. Location: 25 min from Airport, 5 min to Cabo San Lucas.